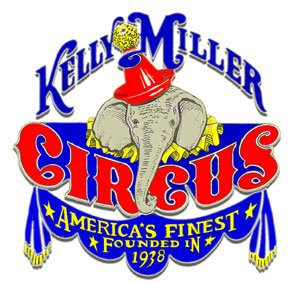 John Ringling North II's "One Ring Wonder", The Kelly-Miller Circus opens today under the Big Top with two performances at 2:00 and 5:30PM in the beautiful Circus City of Hugo, OK deep in the heart of the Red River Valley. 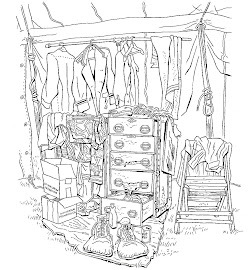 Tomorrow we move to nearby Idabel, OK before two weeks in the Lone Star State. 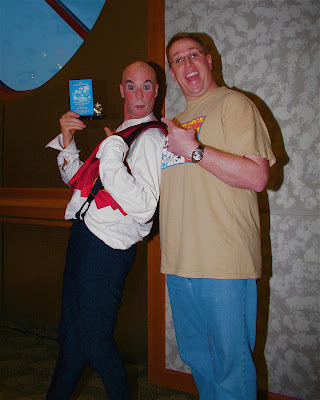 Charlie Frye back when he was merely the best juggler in the Ringling Alley, from back when that used to mean something. 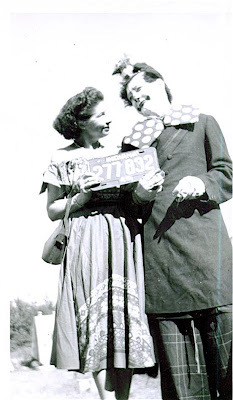 Locke Lorraine with an unidentified woman in an undated photo from an unknown source. You now have a friend for life. All throughout the show Shane was happily munching away, sharing with the kids around him and and telling everyone, "My friend Ruthie gived me this whole thing!!!" 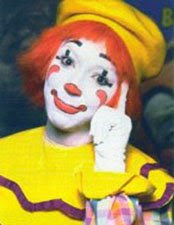 Incidentally, Ms. Chaddock's birthday announcement is also clownalley.net's 1,500th post. 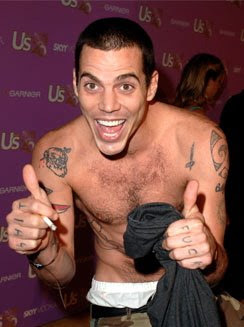 Fellow Clown College class of '97 alumni Steve-O, star of MTV's Jackass and Wildboyz was reported in the media last night as being on 24-hour "suicide watch" in in the psych ward of an L.A. area hospital. I spoke with him last night (isn't there better phone security in L.A. area hospital psych wards? I haven't spoken to Steve-O in 10 years! How the heck did I get through?) and he sounded absolutely fine. He's just going through a rough patch after a break up and some folks close to him chose to err on the side of caution based some emails that he sent out over the weekend. 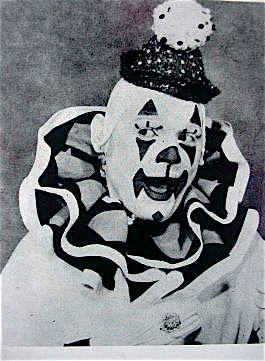 Clown, fan, historian and Clown College staff member Diamond Jim Parker. Very and Well (Starikov & Kotov) in the ring and on ice. 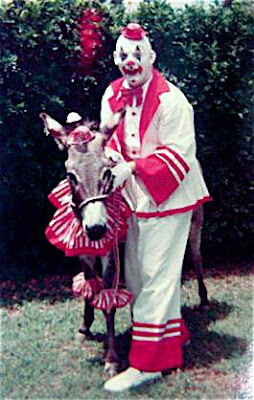 Happy belated birthday to CC grad, Ringling vet, former "Local Merchandising Executive for a Large International Fast Food Company", fellow China Clown and all-around good guy, Mr. Greg May. To learn more about Greg please click here. I had the pleasure of speaking with Otto Griebling's daughter Joanne (the picture to the right is Otto with Joanne's older sister, Elsie) last night, an extremely nice woman who kindly tolerated my many questions. I hope that her computer gets repaired soon so that I may post some of her rememberances in her own words. 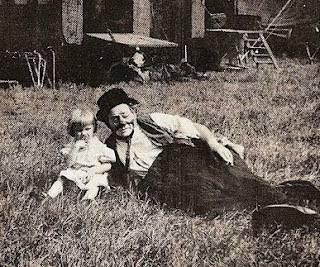 She has some wonderful stories to share and it was clear from our conversation that she loved her father very, very much. I would like to extend this laurel and hearty handshake to today's birthday boy, Mr. Elwood Smooch hisself, ICHOF-er Mr. William James Baker! 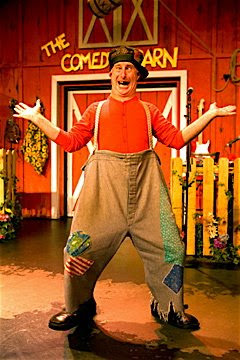 To learn more about Mr. Baker's long and distinguished career in comedy please click here. 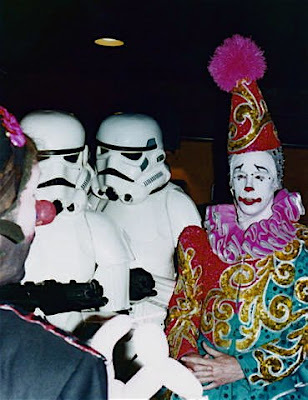 The cellphone photos that I took today of Angie's Circus City Diner, Showman's Rest and the Kelly-Miller, Culpepper & Meriweather and Carson & Barnes Winter Quarters won't "send" from here in Hugo so here is a photo of Tuba Heatherton being accosted by Imperial Stormtroopers. I arrived in Hugo, OK last night, but without my mac's power cord which I left back at the house. Terry is Fed Ex-ing it so I should be back up and running and able to post some photos tomorrow afternoon. Tom Dougherty with the 2007 Otto Griebling Award, presented at the Izod Center during the CFA's Felix Adler Tent "Sugarfest" Saturday March 8, 2007. 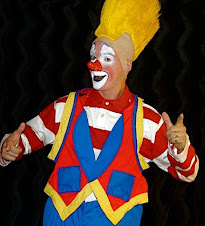 I wish that we had been able to get one group shot with all the current and former Ringling clowns who were in attendance. Slava in 1981, pre-Snow Show. 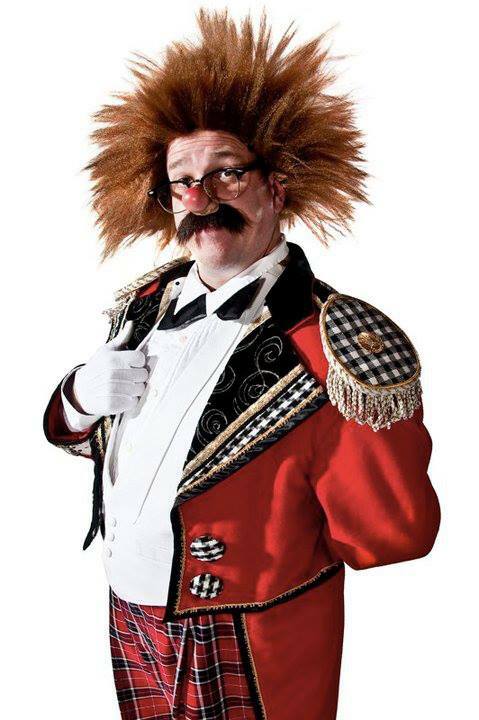 Norvak Poderoso DeMente features Andres Aguilar, a Clown College class of 1996 graduate who toured with the Ringling Blue Unit for two years. 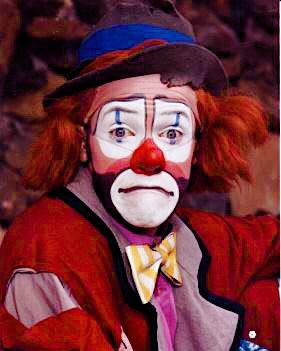 The show is directed by Artus Chavez, same Clown College class and who clowned one season in the Blue Alley. Thanks go out this morning to the Felix Adler Tent of the CFA for another fine "Sugarfest" at the Izod Center (formerly the Continental Airlines Arena, formerly the Meadowlands Arena, formerly the Brendan Byrne Arena, soon to be demolished anyway) at which we had the opportunity to present Tom Dougherty with his 2007 Otto Griebling Award for Solo Clowning. 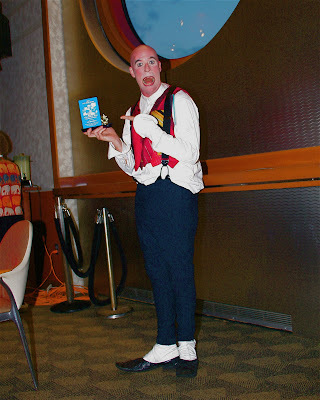 We were fortunate enough to have Ruth Chaddock, Barry Lubin, Fudi, Joel Jeske, Paul and Diane Gutheil, Maxine House, Alan Miller, the Blue Show cast and crew (including the entire Alley), the Circus Fans and many others in attendance for the presentation and I am deeply indebted to Mr. Jeske for his introduction. Tom was genuinely touched and quite honored to be so recognized by his peers and to have the award presented in such an seemingly tailor-made environment. If you have not yet seen the new Blue Show, Tom Dougherty seems to have inhertited James Brown's title as, far and away, the Hardest Working Man in Show Business. He is seldom off the floor and gives 100% throughout the entire show. He's an amazing performer and a wonderful guy and Andrew Scharff and I apologize profusely for unintentionally keeping him out so late in the middle of a six-pack weekend on the night that we set the clocks ahead. D'oh!